Edwin H. Lowe Publishing: Militia Marksmanship Training Manual (Rifle and Submachine Guns). Type 53 Mosin Nagant, Chiang Kai-shek Mauser, Arisaka and M1903 Springfield Rifles; Type 50 (PPSh-41) and Type 54 (PPS-43) Submachine Guns. Militia Marksmanship Training Manual (Rifle and Submachine Guns). Type 53 Mosin Nagant, Chiang Kai-shek Mauser, Arisaka and M1903 Springfield Rifles; Type 50 (PPSh-41) and Type 54 (PPS-43) Submachine Guns. 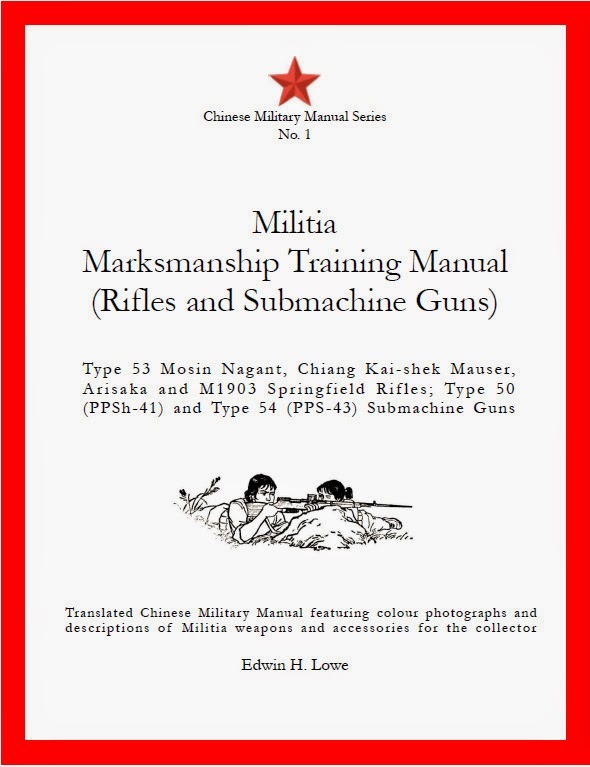 This book is an illustrated training manual first published in 1973 by the People's Liberation Army for the training of the Chinese Militia in World War II era weapons. These are the Type 53 Mosin Nagant, Zhongzheng (Chiang Kai-shek) Mauser, Type 38 Arisaka, Type 99 Arisaka and M1903 Springfield rifles; the Type 50 (PPSh-41) and Type 54 (PPS-43) submachine guns. The manual is presented as a complete and original translation. "This book is the beginning of new revelations into Chinese arms production and use. 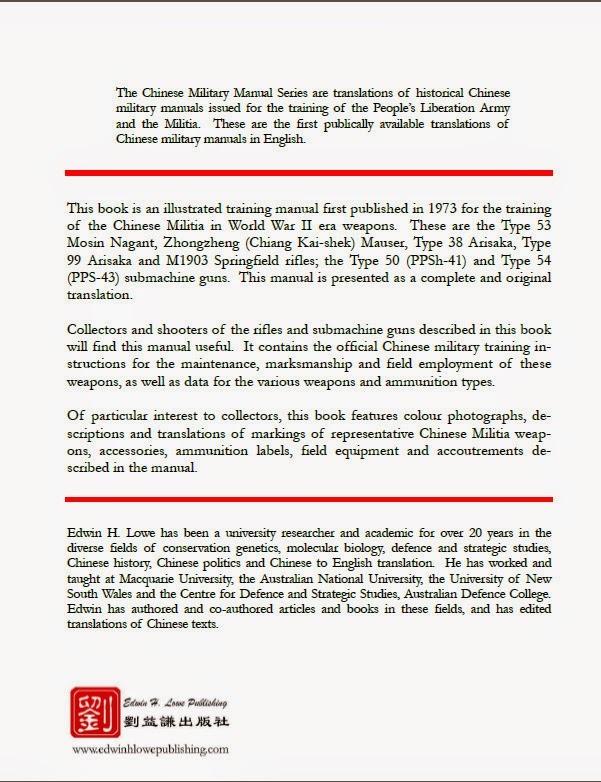 Aside from translating the Chinese Militia Marksmanship Training manual, ( fascinating) Edwin Lowe has added his insights to research providing new information of interest to all collectors of Chinese Weapons. We now know that there is no such thing as "Chu" wood! Forever, it seems, collectors of Type 53 and Type 56 (SKS) have incorrectly identified the wood used on these stocks. We now know the wood is properly called in Chinese qiu wood otherwise known as Catalpa bugei or more commonly Manchurian Catalpa. His explanation of the origin and basis for condition of the many militia guns exported in the 80s and 90s answers questions that have puzzled collectors for years.... These are a must buy for collectors and will definitively answer and provide accurate direction for all future discussions of Chinese weapons. A well written translation, easy to read with sufficient explanations & citations to understand the content. Manual covers various weapons, tactics & accessories. There is also some interesting background information concerning not only the weapons involved but also the tactical/ political/ social/ technological issues & influences of the period. This manual sits comfortably alongside the Mosin Nagant Manuals (both J F Gebhardt & T W Lapin) & The Partisan's Companion (L Grau, M Gress). Recommended reading.